By Gieves Ltd. Size marked as 63/4, physically measuring approximately 53.5cm. 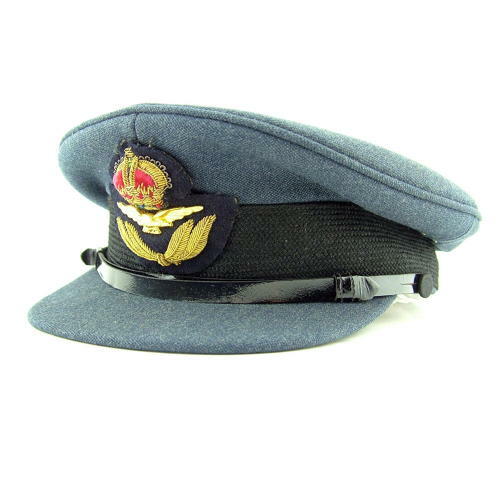 Standard peaked cap with King's crown bullion badge. The cloth is generally in very good '+' to excellent condition apart from one small moth nip on the undeside of the peak. Excellent mohair band and badge. Very good leather strap and inner leather band. The inside of the cap is covered with a 'greasepaper' liner that is slightly tacky. The Gieves label can be seen beneath this and notes 'By apppointment to the H.M. the king'. The cap is currently padded with tissue paper to prevent the lining from sticking to itself. Good inner leather band. A very good cap. Fits a standard mannequin head. Stock code U22340.